Members of the Durango third-grade YAFL team celebrate their team championship last Saturday at Bloomfield High School. The Demons won 12-6 over the Farmington Crush. The Young America Football League will have one defending champion heading into next season. 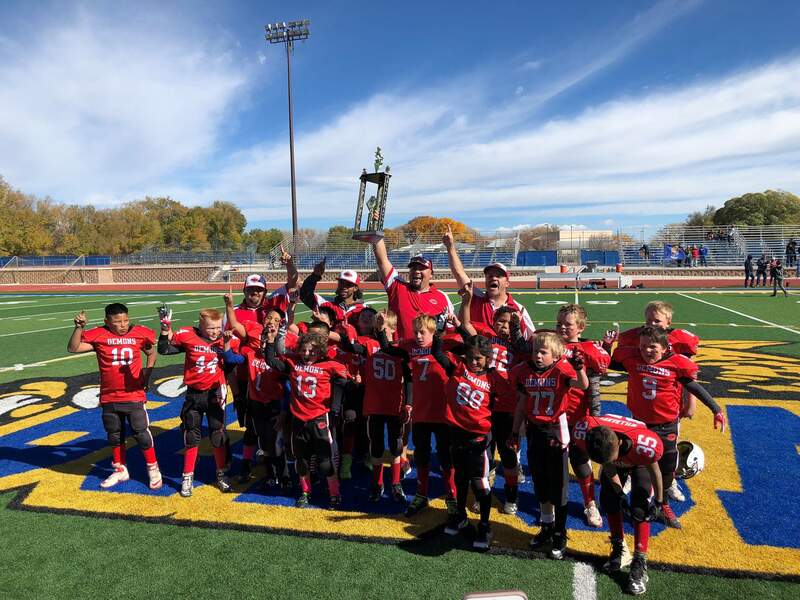 Durango’s third-graders defeated the Farmington Crush 12-6 to win the YAFL Super Bowl last Saturday at Bloomfield High School in New Mexico. The team finished the season undefeated at 9-0. The defense gave up a total of 12 points all season. Demons running back Malique Rodriguez had both scores on the afternoon, as he had touchdown runs of 12 and 25 yards. Jerad Lopez and Isaiah McCrady shared the quarterback duties, and both had standout games, as McCrady ran for 113 yards while Lopez had 72. On defense, the Demons gave up only their second touchdown of the entire season. But they were able to respond, as they recovered two Crush fumbles, one by Griffin McCroskey and the second from Rylan Ernst. Other members of the Demon defense that contained the Crush on Saturday included Darion Allen, Owen Erwin and Oliver Nez, all of whom made numerous stops on the afternoon. The third-graders advanced to the championship game by defeating the Farmington Bulldogs 20-6 in the semifinals, as the defense gave up its first touchdown of the entire season. The sixth-graders fell in their Super Bowl game against the Farmington Titans last Saturday at Bloomfield High School. Statistics were not made available. It was the fourth consecutive season that the sides met up in the Super Bowl, as Farmington defeated Durango 26-2 last season and won again Saturday. The sixth-graders advanced to the championship after they defeated Aztec 36-0 in the semifinals.